SOMAB is a designer - manufacturer of assisted or CNC machines tools, working by metal chip removal. Its reputation, as a performing and innovative company, is based on two major concepts: technology and ergonomics. SOMAB is a 30-year old company, but also has 150 years of experience. Fabricated with a high-tech micro concrete machine base and a reconstituted granite bed, well known for its vibration damping properties and its good thermal stability, SOMAB machines are both robust and accurate. 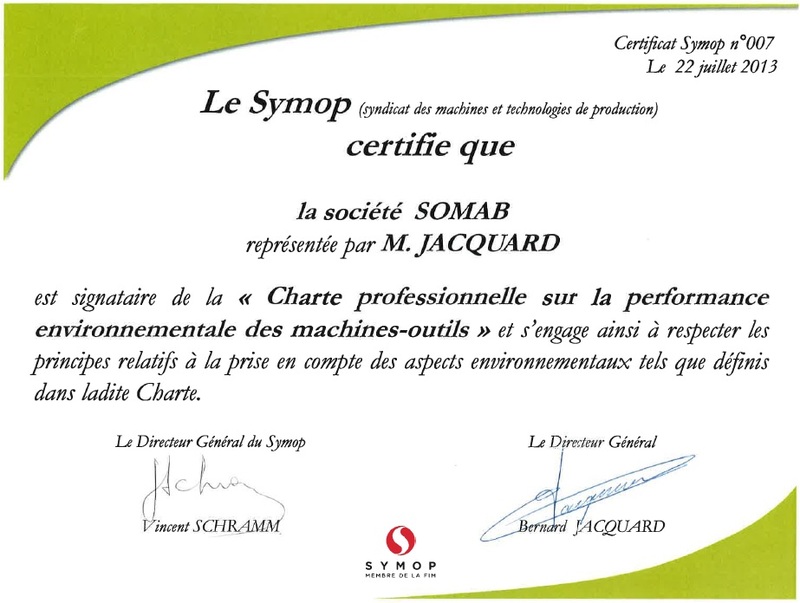 SOMAB is an award-winning company for technology innovations. The machine teach-in module is recognized for its quick and easy storage ability of motions performed first in manual mode. 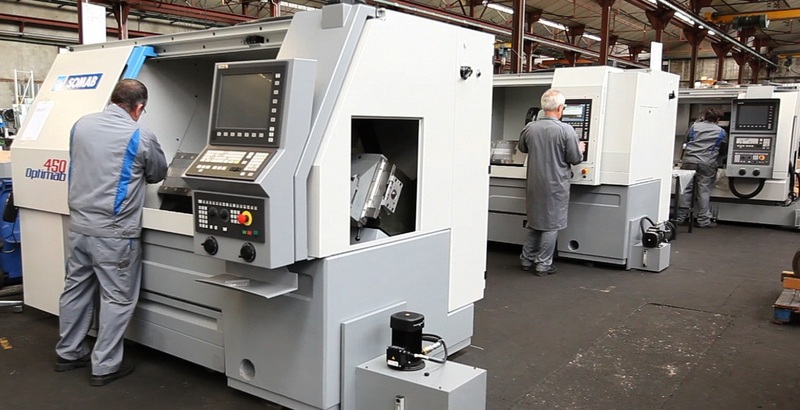 The program thus stored allows automatic production of following parts of the range. SOMAB: the first company to invent, in 1985, teach-in programming of machines, through manual operations. Small and medium size general engineering companies. Production plants of major companies in automotive, aerospace, rail, defense, ... sectors. Engineering workshops for medical parts, metal tubes, musical instruments. Technical training centers and schools. · Small and medium size general engineering companies. Installed in 8000 m2-covered facilities, SOMAB includes several units. Skilled and trained men and women, faithful to the company, run SOMAB. The workshop comprises thirty modern machine tools. Over 70% of them are CAM and CNC controlled. Connected to a computer controlled by the Method Department team parts programs are generated and directly uploaded to production machines, as well as all data required to prepare tools (selection from a central file, presetting, etc.). In this plant SOMAB produces 90% of mechanical parts used in its machines. The first one is used to overmould guide-way supports. Guide-ways are first ground on reconstituted granite beds, and then assembled. 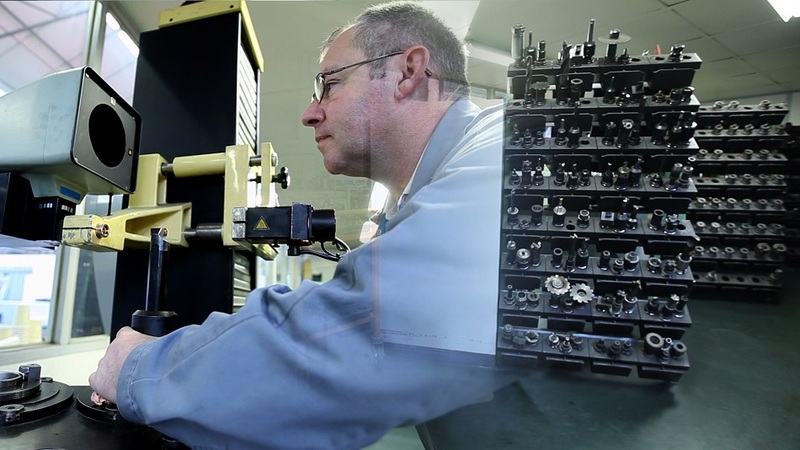 The second one is used to assemble, balance and test precision spindles, which are fitted on SOMAB machines. From Standard to tailor-made products. SOMAB provides technical consulting, marketing, installation and commissioning in customers’ workshops. SOMAB provides training, warranty, maintenance and services for all machines it supplies. SOMAB achieves compliance, modernization of machines, adaptation to new needs or reconstruction, for SOMAB machines as well as for any other brands.